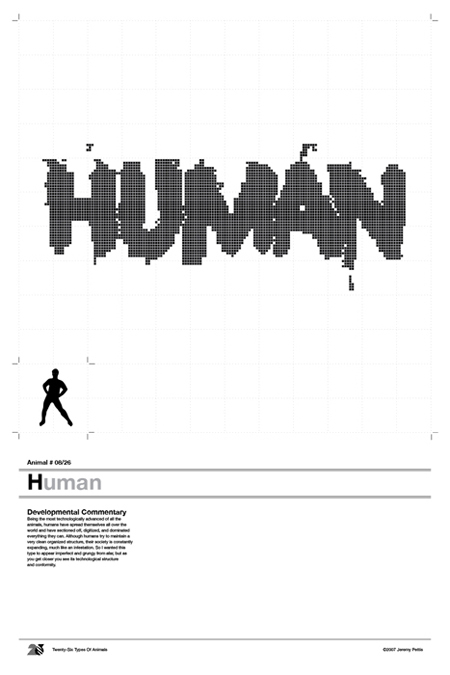 To most people Typography means nothing more than what the words or letters say. This may be because our brain subconsciously reads everything our eyes land on and immediately tells us what information that type is trying to say. So there is really little need for anyone to pay any close attention to Typography, and most people don't. Normally, a person's relationship with a word lasts milliseconds, or maybe seconds depending on how long and complex the word is. With this project I'm hoping to change all of this. Since Typography is this sort of foreign land I decided to lure people within it by combining it with a very familiar comfortable subject, animals. Since we were children we have learned all about animals, their name, shape, attitude, habitat, you name it. You most definitely learned about the animals prior to acquiring the skill of reading written type/language. 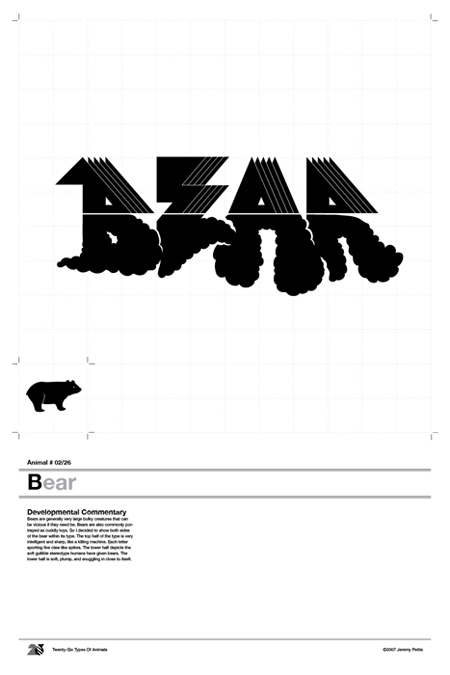 I also feel that animals are the perfect subjects for typographic exploration. Much like typefaces, there are millions of species all having their own set of unique variant sub-divisions. So using animals as a bridge, I will show you how much life and personality Typography actually has within, and hopefully the type will linger in your mind longer than the average word would. 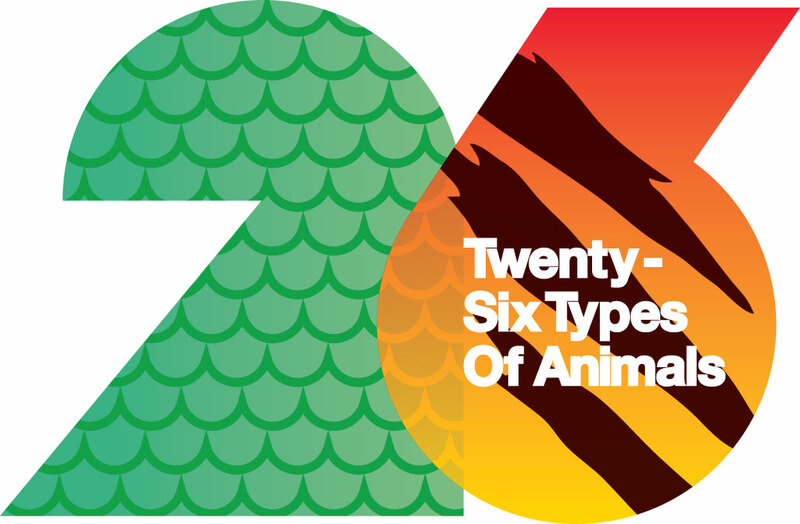 I did one typographic study for every letter of the alphabet, one animal for each letter. 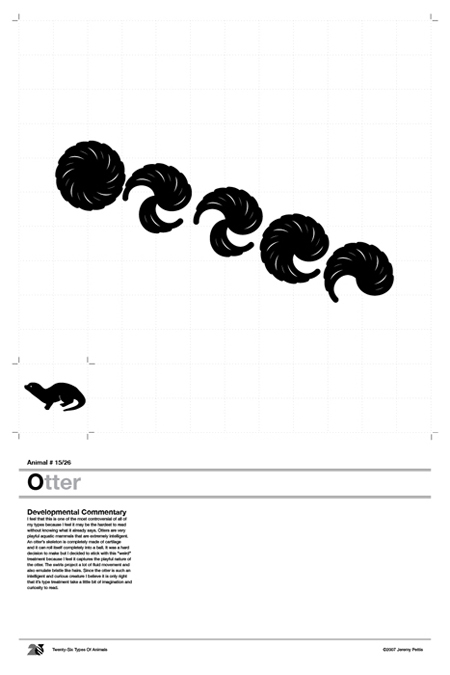 Also to aid your understanding I developed a simple glyph for each of my animal subjects. The glyph should pick up the slack if your brain is falling short or having trouble making out the word that lies within the type. Some of this typography might be unreadable, but I invite you to step in and explore the Typography and pick it apart, try to understand what is going on within it. Think of it like your 9th grade biology class when you dissected the frog. You need to now get inside and understand that which you come into contact with daily, typography. Of course just to be on the safe side I will be providing you with what I'm calling "Developmental Commentary." In other words, I will try to explain to you what I was thinking, or what was taken into consideration while planning and executing the Typographic solution. At first I was going to just list certain characteristics that I focused on during the initial sketching of the type but I feel that may be a little too abstract for some. I might also be able to make it more interesting. 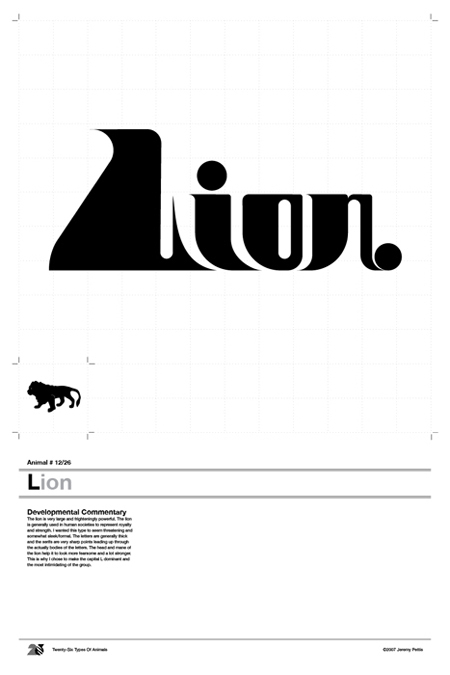 I hope you enjoy your typographic safari. Alligators are rough and grimy. Living mostly in mucky water and swamps, I wanted this type to be a little rough around the edges. The large wedged gap was meant to emulate one of the alligator's most recognizable features, it's mouth. However it also relates to how you most times see an alligator, submerged. 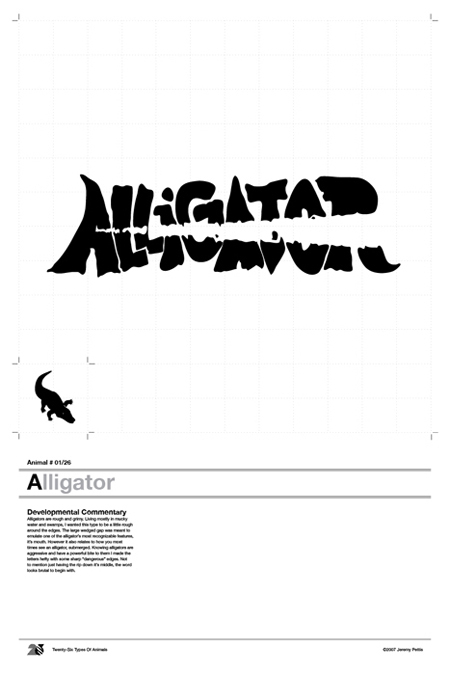 Knowing alligators are aggressive and have a powerful bite to them I made the letters hefty with some sharp "dangerous" edges. Not to mention just having the rip down it's middle, the word looks brutal to begin with. Bears are generally very large bulky creatures that can be vicious if they need be. Bears are also commonly portrayed as cuddly toys. So I decided to show both sides of the bear within its type. The top half of the type is very intelligent and sharp, like a killing machine. Each letter sporting five claw like spikes. The lower half depicts the soft gullible stereotype humans have given bears. The lower half is soft, plump, and snuggling in close to itself. Cobras are the world's largest venomous snakes. Although the cobra has enough venomous power in one bite to kill an adult elephant, it generally prefers to avoid human confrontation. After learning this I decided to play down the villainous side of the cobra and focus on its size and hypnotic stereotypes. With its interlocking loops, this type has a hypnotic swirl to it and a sort of thickens towards its mid section. 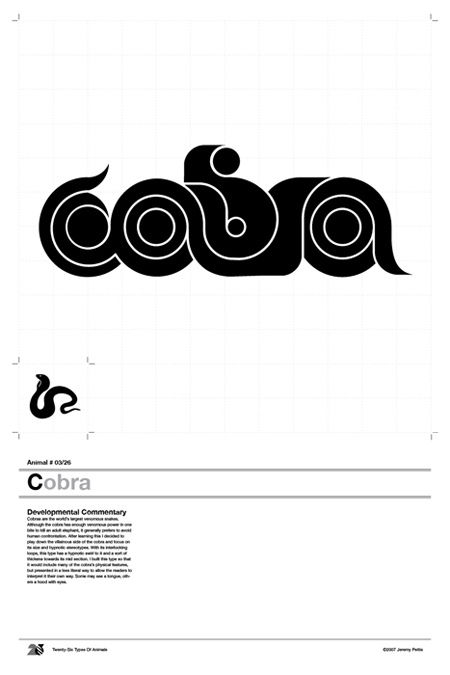 I built this type so that it would include many of the cobra's physical features, but presented in a less literal way to allow the readers to interpret it their own way. Some may see a tongue, others a hood with eyes. Since dolphins reside in water, I thought it would be fun to execute this type in a liquid based medium. Making it very fluid and playful, I rendered the type by hand with a brush and India ink. This process was fun, giving me a lot of room to play with the movement and flow of the type. I scanned and tweaked the letters to make their inner movements a little cleaner and slicker. 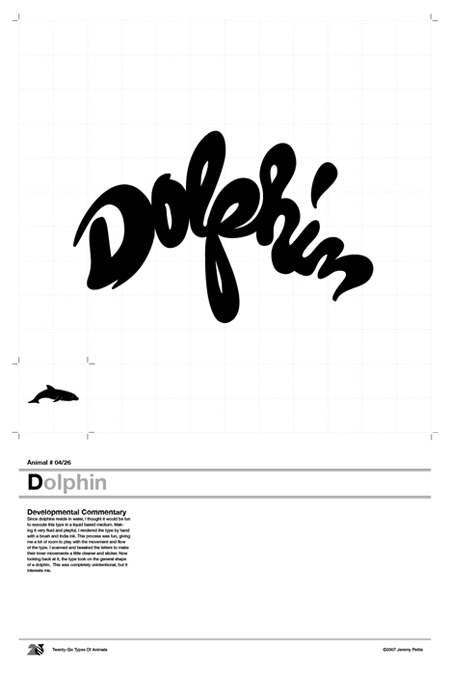 Now looking back at it, the type took on the general shape of a dolphin. This was completely unintentional, but it interests me. Emu's are top heavy birds with long powerful legs. Fluffy patches of feathers cover their flightless wings. This type is designed to be tall, awkward and appear flightless. The characters' extra weight upstairs is supported with solid and powerful ?legs.? 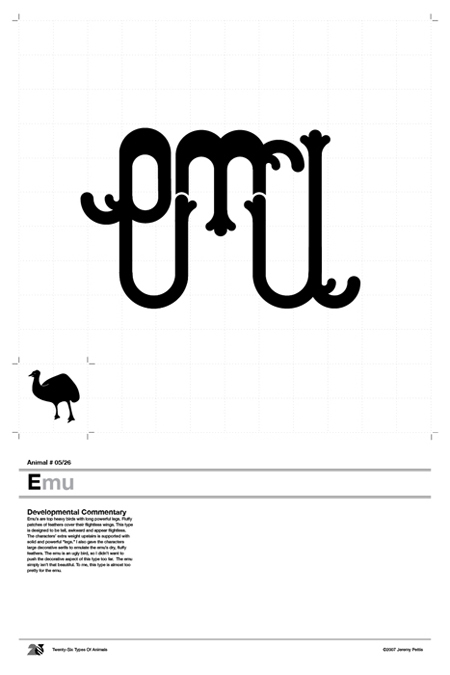 I also gave the characters large decorative serifs to emulate the emu's dry, fluffy feathers. The emu is an ugly bird, so I didn't want to push the decorative aspect of this type too far. The emu simply isn't that beautiful. To me, this type is almost too pretty for the emu. As one of the largest bats, I gave this type a lot of exotic power. The high contrast in stroke weights not only gives it an alluring vibration, but is also a metaphor to the structure of the bat itself. A fruit bat's wing is a series of thin fragile bones with a skin membrane stretched over them. The fruit bat also has a very large body and an opposable second claw. This claw is the reason behind this type's sharp serifs. Think of it as this type's way of hooking onto something it plans on eating. 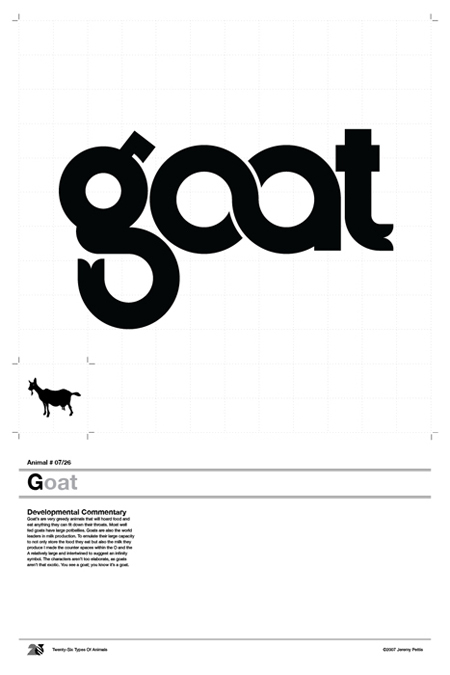 Goat's are very greedy animals that will hoard food and eat anything they can fit down their throats. Most well fed goats have large potbellies. Goats are also the world leaders in milk production. To emulate their large capacity to not only store the food they eat but also the milk they produce I made the counter spaces within the O and the A relatively large and intertwined to suggest an infinity symbol. The characters aren't too elaborate, as goats aren't that exotic. You see a goat; you know it's a goat. Being the most technologically advanced of all the animals, humans have spread themselves all over the world and have sectioned off, digitized, and dominated everything they can. Although humans try to maintain a very clean organized structure, their society is constantly expanding, much like an infestation. So I wanted this type to appear imperfect and grungy from afar, but as you get closer you see its technological structure and conformity. Iguanas don't necessarily look too friendly, but they are actually calm friendly pets that some say are a lot like humans. They have very powerful limbs that they use to swim and climb. I wanted this type to leave you within a middle ground where you don't know whether or not to trust this thing. Parts of it look dangerous and aggressive, yet others look relaxed and friendly. 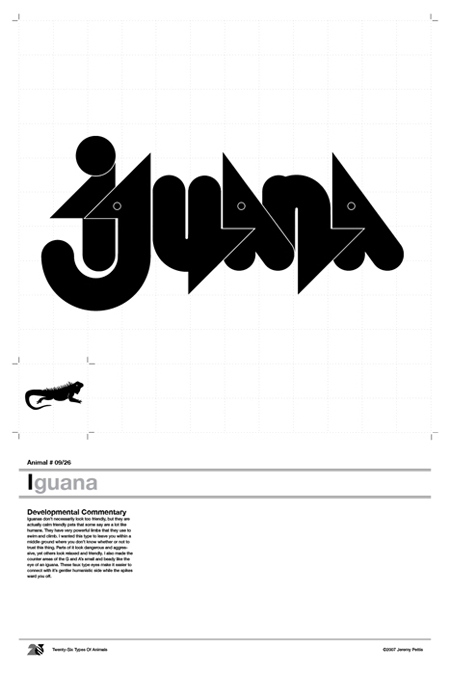 I also made the counter areas of the G and A's small and beady like the eye of an iguana. These faux type eyes make it easier to connect with it's gentler humanistic side while the spikes ward you off. At first glance, the jellyfish is a beautiful creature. Yet, it is also capable of inducing extreme pain. 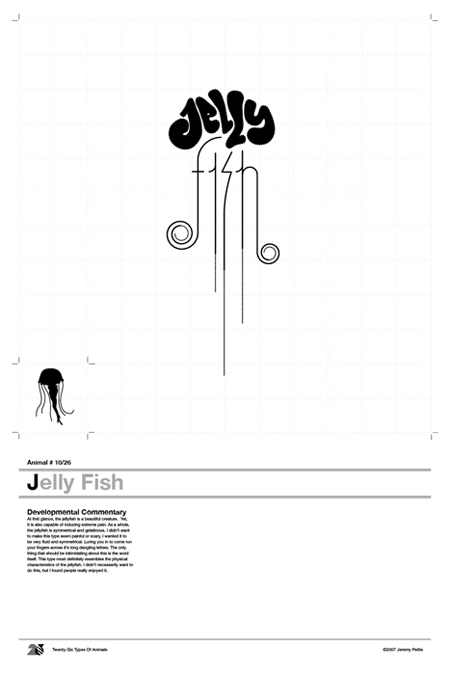 As a whole, the jellyfish is symmetrical and gelatinous. I didn't want to make this type seem painful or scary, I wanted it to be very fluid and symmetrical. Luring you in to come run your fingers across it's long dangling letters. The only thing that should be intimidating about this is the word itself. This type most definitely resembles the physical characteristics of the jellyfish. I didn't necessarily want to do this, but I found people really enjoyed it. As you may already know, the kangaroo hops instead of walking. So for this type I chose to make the letters have a rounded bounce to them. The rounded pieces are used as transitions from one latter to the next. 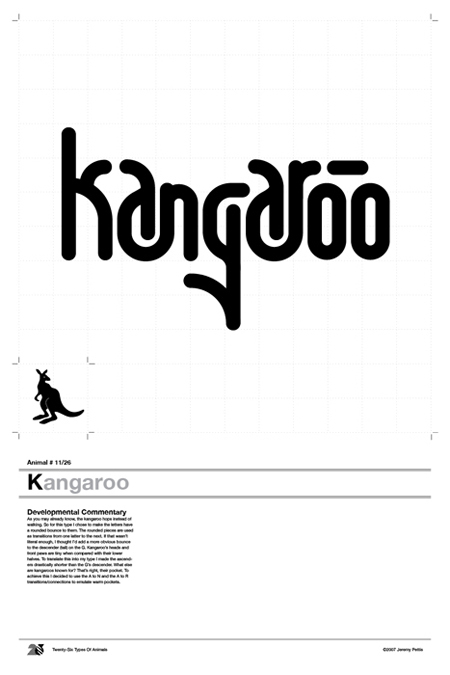 If that wasn't literal enough, I thought I'd add a more obvious bounce to the descender (tail) on the G. Kangaroo's heads and front paws are tiny when compared with their lower halves. To translate this into my type I made the ascenders drastically shorter than the G's descender. What else are kangaroos known for? That's right, their pocket. To achieve this I decided to use the A to N and the A to R transitions/connections to emulate warm pockets. The lion is very large and frighteningly powerful. The lion is generally used in human societies to represent royalty and strength. I wanted this type to seem threatening and somewhat sleek/formal. The letters are generally thick and the serifs are very sharp points leading up through the actually bodies of the letters. The head and mane of the lion help it to look more fearsome and a lot stronger. This is why I chose to make the capital L dominant and the most intimidating of the group. 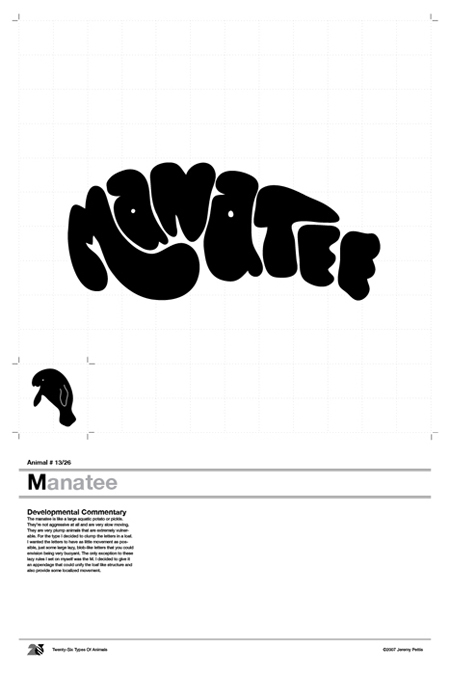 The manatee is like a large aquatic potato or pickle. They're not aggressive at all and are very slow moving. They are very plump animals that are extremely vulnerable. For the type I decided to clump the letters in a loaf. I wanted the letters to have as little movement as possible, just some large lazy, blob-like letters that you could envision being very buoyant. The only exception to these lazy rules I set on myself was the M. I decided to give it an appendage that could unify the loaf like structure and also provide some localized movement. 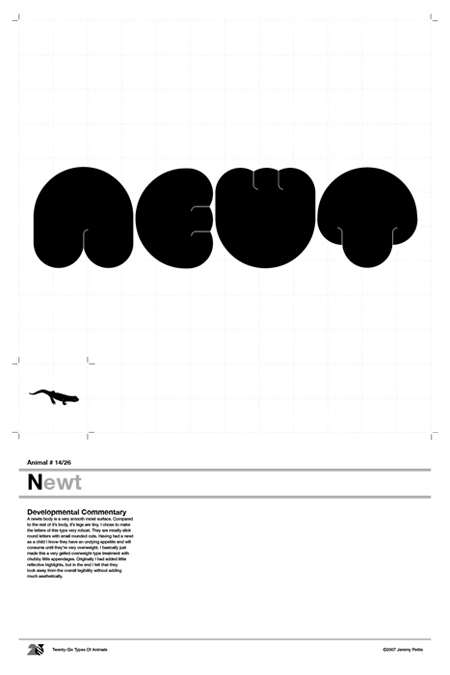 A newts body is a very smooth moist surface. Compared to the rest of it's body, it's legs are tiny. I chose to make the letters of this type very robust. They are mostly slick round letters with small rounded cuts. Having had a newt as a child I know they have an undying appetite and will consume until they're very overweight. I basically just made this a very gelled overweight type treatment with chubby little appendages. Originally I had added little reflective highlights, but in the end I felt that they took away from the overall legibility without adding much aesthetically. I feel that this is one of the most controversial of all of my types because I feel it may be the hardest to read without knowing what it already says. Otters are very playful aquatic mammals that are extremely intelligent. An otter's skeleton is completely made of cartilage and it can roll itself completely into a ball. It was a hard decision to make but I decided to stick with this ?weird? treatment because I feel it captures the playful nature of the otter. The swirls project a lot of fluid movement and also emulate bristle like hairs. Since the otter is such an intelligent and curious creature I believe it is only right that it's type treatment take a little bit of imagination and curiosity to read. 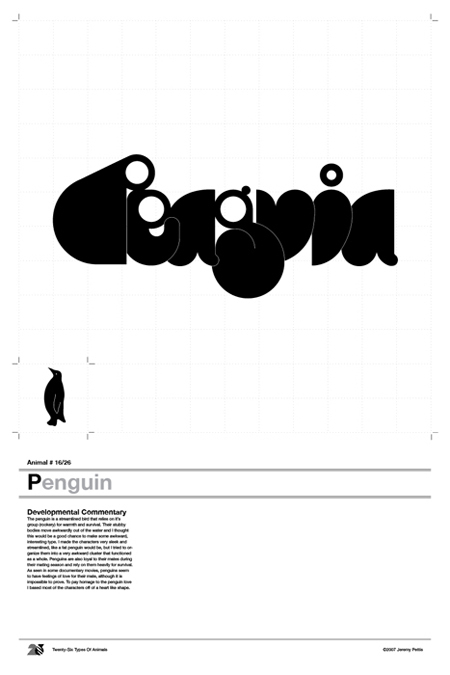 The penguin is a streamlined bird that relies on it's group (rookery) for warmth and survival. Their stubby bodies move awkwardly out of the water and I thought this would be a good chance to make some awkward, interesting type. I made the characters very sleek and streamlined, like a fat penguin would be, but I tried to organize them into a very awkward cluster that functioned as a whole. Penguins are also loyal to their mates during their mating season and rely on them heavily for survival. As seen in some documentary movies, penguins seem to have feelings of love for their mate, although it is impossible to prove. To pay homage to the penguin love I based most of the characters off of a heart like shape. 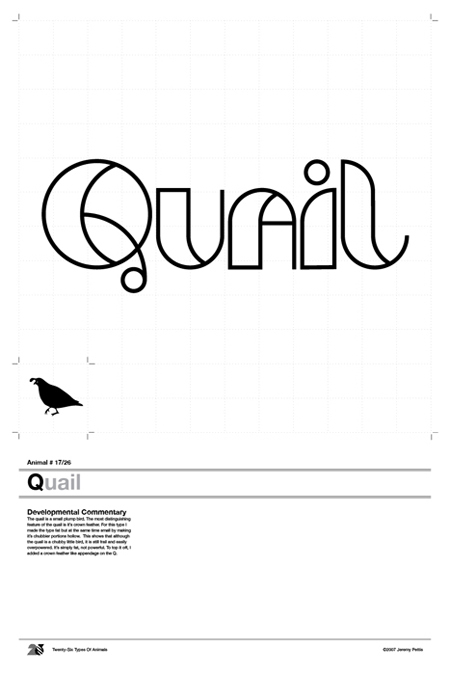 The quail is a small plump bird. The most distinguishing feature of the quail is it's crown feather. For this type I made the type fat but at the same time small by making it's chubbier portions hollow. This shows that although the quail is a chubby little bird, it is still frail and easily overpowered. It's simply fat, not powerful. To top it off, I added a crown feather like appendage on the Q. In the Midwest it is very common to spot a rabbit. They're everywhere and are almost as common as the squirrel. One of their most identifiable traits is their oversized ears. Rabbits can be playful but are overall pretty chill animals. For this type, I decided to make something that would seem a little more generic and everyday. Giving you the same feeling for the type as you would if you saw the rabbit. 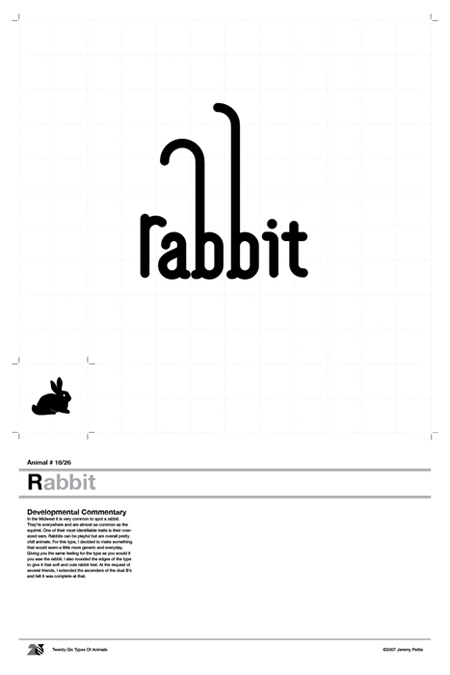 I also rounded the edges of the type to give it that soft and cute rabbit feel. At the request of several friends, I extended the ascenders of the dual B's and felt it was complete at that. The snail spends its whole life in its rounded protective shell. The snail's entire body is a long mucus producing foot that it slides along. Its foot body is smooth and rounded like a melting hotdog. The snail is a very timid creature that never ventures too far from its shell unless it must. The type is made up of protective, shield-like pieces and smaller bits that struggle to get up the courage to stray far from their ?home.? 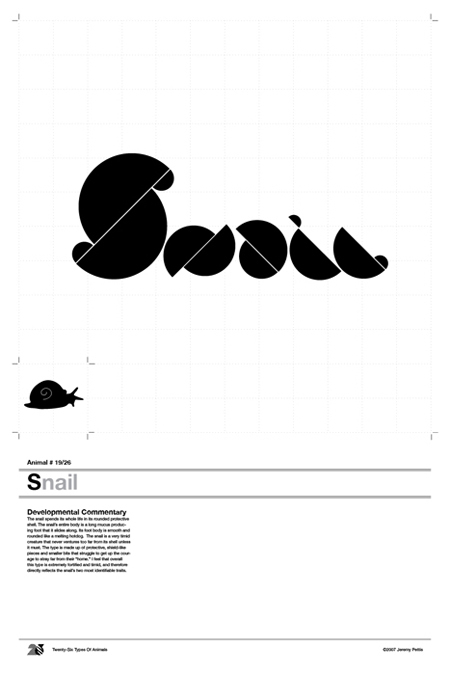 I feel that overall this type is extremely fortified and timid, and therefore directly reflects the snail's two most identifiable traits. Tigers are fierce carnivores. They kill and eat anything as small as a rabbit and as large as an adult elephant. Their choice killing techniques are tearing out the throat or severing the spinal cord. 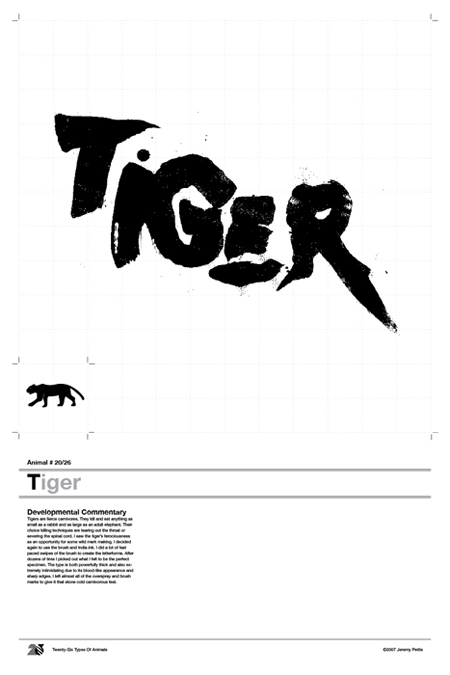 I saw the tiger's ferociousness as an opportunity for some wild mark making. I decided again to use the brush and India ink. I did a lot of fast paced swipes of the brush to create the letterforms. After dozens of tries I picked out what I felt to be the perfect specimen. The type is both powerfully thick and also extremely intimidating due to its blood-like appearance and sharp edges. I left almost all of the overspray and brush marks to give it that stone cold carnivorous feel. The unicorn is a magical creature of legend. 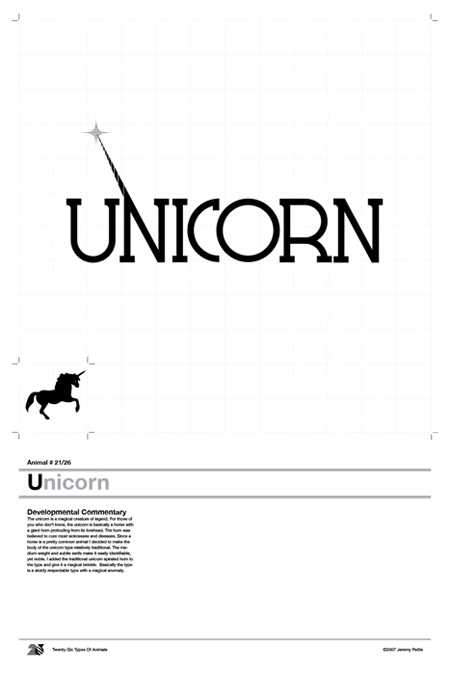 For those of you who don't know, the unicorn is basically a horse with a giant horn protruding from its forehead. The horn was believed to cure most sicknesses and diseases. Since a horse is a pretty common animal I decided to make the body of the unicorn type relatively traditional. The medium weight and subtle serifs make it easily identifiable, yet noble. I added the traditional unicorn spiraled horn to the type and give it a magical twinkle. Basically the type is a sturdy respectable type with a magical anomaly. The vulture is an ugly scavenger that preys on the weak, dying, and dead. 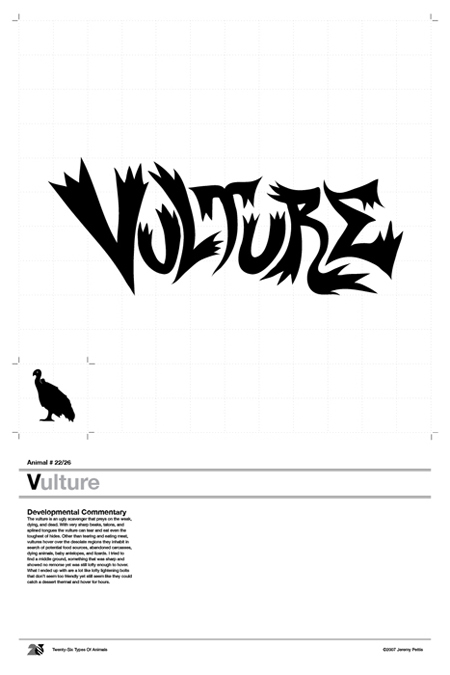 With very sharp beaks, talons, and splined tongues the vulture can tear and eat even the toughest of hides. Other than tearing and eating meat, vultures hover over the desolate regions they inhabit in search of potential food sources, abandoned carcasses, dying animals, baby antelopes, and lizards. I tried to find a middle ground, something that was sharp and showed no remorse yet was still lofty enough to hover. What I ended up with are a lot like lofty lightening bolts that don't seem too friendly yet still seem like they could catch a dessert thermal and hover for hours. 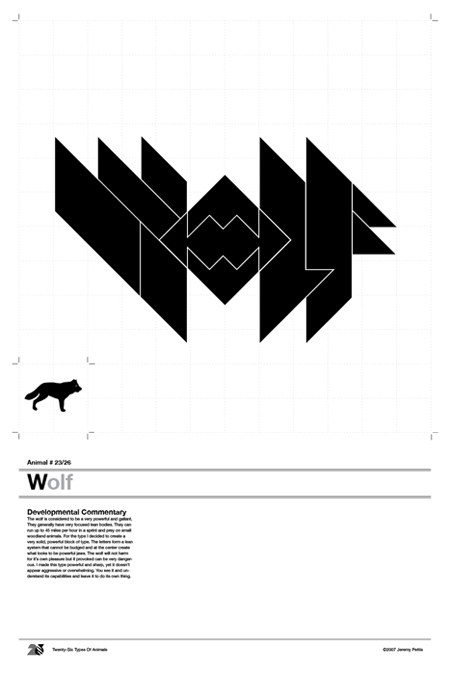 The wolf is considered to be a very powerful and gallant. They generally have very focused lean bodies. They can run up to 45 miles per hour in a sprint and prey on small woodland animals. For the type I decided to create a very solid, powerful block of type. The letters form a lean system that cannot be budged and at the center create what looks to be powerful jaws. The wolf will not harm for it's own pleasure but if provoked can be very dangerous. I made this type powerful and sharp, yet it doesn't appear aggressive or overwhelming. You see it and understand its capabilities and leave it to do its own thing. 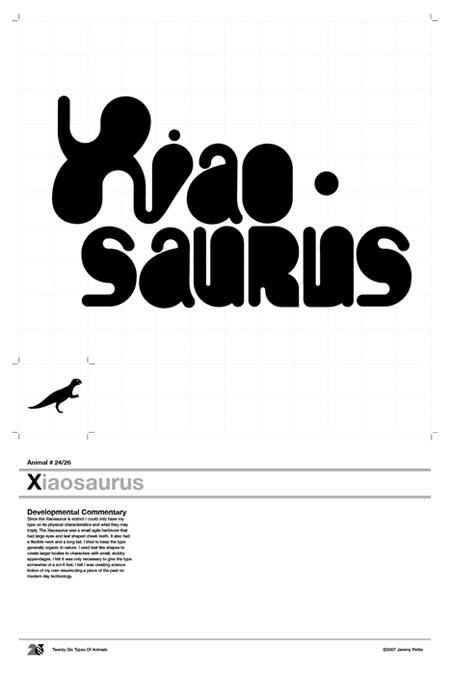 Since the Xiaosaurus is extinct I could only base my type on its physical characteristics and what they may imply. The Xiaosaurus was a small agile herbivore that had large eyes and leaf shaped cheek teeth. It also had a flexible neck and a long tail. I tried to keep the type generally organic in nature. I used leaf like shapes to create larger bodies to characters with small, stubby appendages. I felt it was only necessary to give the type somewhat of a sci-fi feel. I felt I was creating science fiction of my own resurrecting a piece of the past on modern day technology. The Yak in the wild is a tremendously powerful creature that can stand it's ground to almost anything. It also has a thick coat of long, coarse hair. 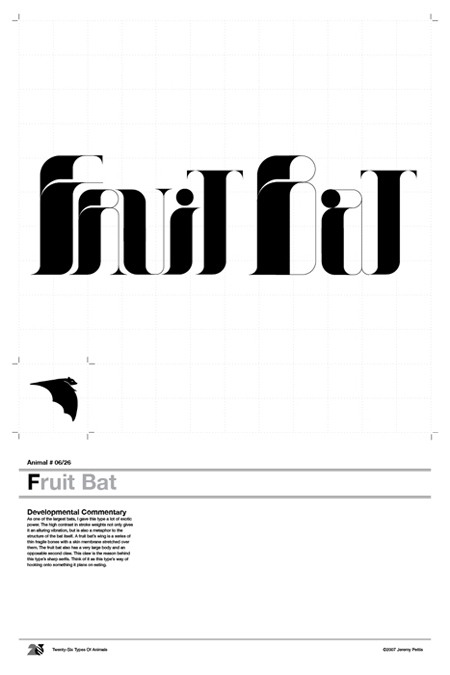 I made this my thickest and sturdiest typographic study. Then filled in the negative space with a stern crop of rigid lines to emulate the impenetrable coat of hair the yak adorns. 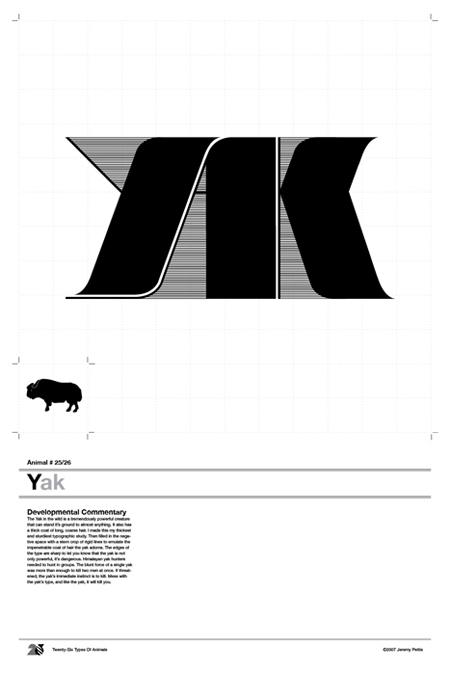 The edges of the type are sharp to let you know that the yak is not only powerful, it's dangerous. Himalayan yak hunters needed to hunt in groups. The blunt force of a single yak was more than enough to kill two men at once. If threatened, the yak's immediate instinct is to kill. Mess with the yak's type, and like the yak, it will kill you. The zebra is most known for it's immaculate camouflage. Other than it's stripes though, it basically resembles a stubby horse. The zebra spends its days avoiding predators, drinking, and grazing. For the execution of this type I decided to start by creating some basic block sans serif letters. I then took those letters and broke them down into a series of stripes that subtly fluctuated in size and shape. 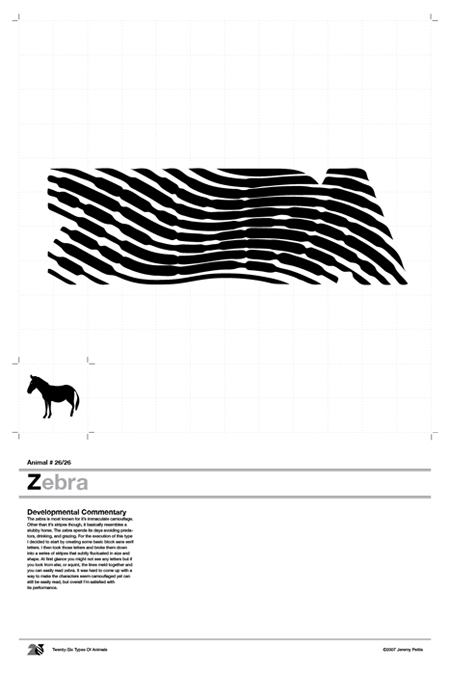 At first glance you might not see any letters but if you look from afar, or squint, the lines meld together and you can easily read zebra. It was hard to come up with a way to make the characters seem camouflaged yet can still be easily read, but overall I'm satisfied with its performance.